Monday morning greetings from Lafayette, In.! We’re back on the road for the next couple of weeks, so our first stop is a shoot here in Lafayette for the next couple of days and then we’ll be heading back out West after that. It’s that time of the year when we are still in our busy season for another month and a half right up to Labor Day weekend, so we are ready for it! We had a great shoot this past week for a new client for us. Fort Transfer is a trucking company based out of Morton, Illinois and unless you’re in the farming business, you’ve probably never heard of them. 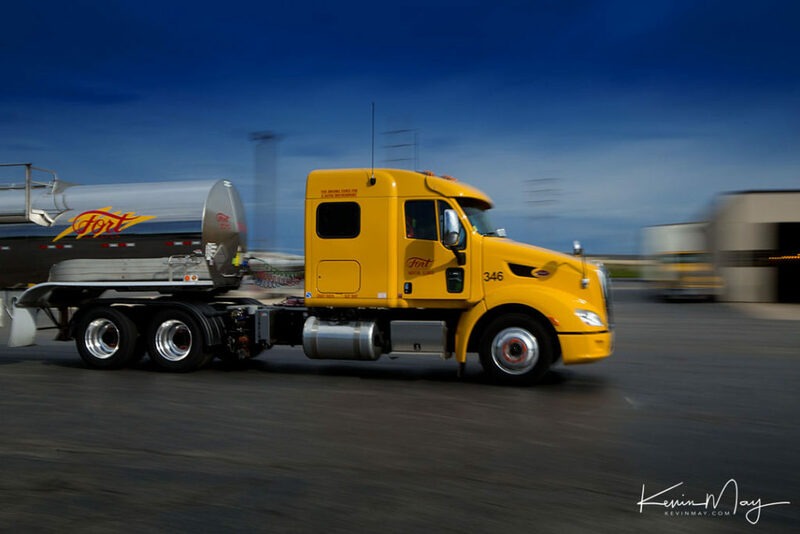 They deliver bulk liquid farming products to all 48 states in the continental US and also up to Canada as well. We had a lot of fun shooting a variety of photos of the operation and some of the people that worked there as well. One of the fun shots that we are sharing today is a little action shot. When something that moves like a vehicle (car, plane, train, truck, etc. ), it’s always great to use a slower shutter speed and allow the background to have a little blur. It’s really helps give the sense of speed and motion. Here’s one of our photos from our day with Fort Transfer. Day one is about to get started, so we hope that you’re going to have a great week!! !